The New England Patriot’s Super Bowl victory parade is scheduled to take place on Wednesday, February 4, come rain or shine- well, in this case come snow or shine. Start Time: 11 A.M (EST) at the Prudential Tower. 25 Duck boats will make their way from the Tower down to City Hall, along the same route used in past years. However, unlike past years there will be no rally in the steps of City Hall. 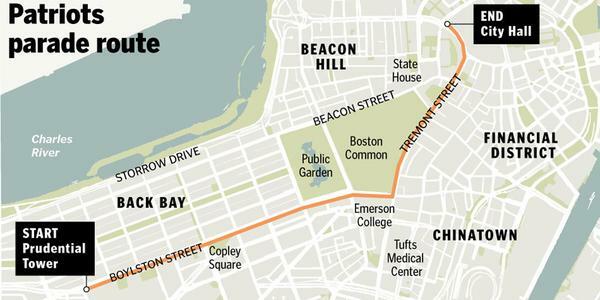 For those planning to go there is a map of the parade route below. The parade will be broadcast through local Boston TV stations and live streaming will also be available through CBS Boston. Due to the heavy snowfall that recently took place there are large snow banks,limiting the amount of people who can watch so the Mayor of Boston has advised that those planning to attend should arrive early. He also cautioned that no one is permitted to stand on the snow banks and that the Boston police force would be out to enforce this rule. Even thought the weather center is calling for more snow the parade will not be postponed again and many fans agree- saying they will be there no matter what. Will you be attending or watching the parade? Tell us if you plan to go below.